MINNEAPOLIS— The Center for Biological Diversity and Honor the Earth today filed a legal petition seeking federal Endangered Species Act protection for a subspecies of moose found in the Midwest. Due to climate change, habitat degradation, disease and other factors, the moose population is in sharp decline, including a nearly 60 percent decrease in Minnesota in just 10 years. Photo by Ryan Hagerty, USFWS. This photo is available for media use. 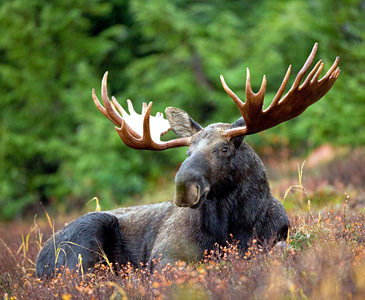 Today’s petition seeks Endangered Species Act protection for the United States’ population of the moose subspecies (Alces alces andersoni) found only in the Midwest. Specifically the petition includes moose in northeastern and northwestern Minnesota, northeastern North Dakota, the Upper Peninsula of Michigan and Isle Royale, as well as a small, recently established population in Wisconsin. Moose declines are particularly severe in Minnesota, with only an estimated 3,500 moose surviving there today. Scientists have warned the animals will be nearly extirpated from Minnesota within five years if the trend is not reversed; they are already almost gone from northwestern Minnesota. Moose are built to live in cold environments with thick insulating fur to survive freezing temperatures and long legs and wide feet to move easily through deep snow. Rising temperatures and decreasing snowfall put moose at increased risk of overheating, which leads to malnutrition and lowers their immune systems, while ticks and other pathogens thrive in a warming climate. Protection under the Endangered Species Act for the moose would highlight the cost of failing to address emissions of greenhouse gases, bring additional federal dollars for research on the plight of the moose and provide additional habitat protections that are needed to help moose weather our warming world. The Fish and Wildlife Service must respond to today’s petition by issuing a “90-day finding” on whether the petition warrants further review. Moose are the largest members of the deer family with massive heads, long noses, short tails, humped shoulders and large ears. Male moose can be nearly 40 percent larger than females and possess impressive sets of antlers — the largest of any living member of the deer family — that can weigh more than 75 pounds. Unlike most deer species, moose are solitary, coming together only during rut and before migrating. Moose are generalist browsers that feed on leaves, stems, buds, grasses, forbs, lichens, mosses, mushrooms and even the bark on trees, although this is usually a sign of malnutrition. In response to the dramatic declines, Minnesota cancelled its moose hunt in 2013, and North Dakota reduced the number of hunting tags. Michigan and Wisconsin have never allowed moose hunting. Earlier this year Gov. Mark Dayton halted all radio collaring of the animals in Minnesota, citing the number of moose killed after scientists handled them. Moose are listed as “species of special concern” in Michigan and Minnesota, but this status does not afford any protections to the animals or their habitat. Honor the Earth is a Native-led organization that works to create awareness and support for Native environmental issues and to develop needed financial and political resources for the survival of sustainable Native communities.